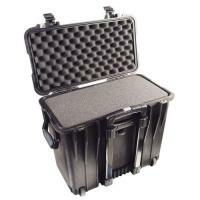 Pelican 1440 Top Loader Case 17.10" x 7.50" x 16.00" FREE SHIPPING! Home > Pelican > Equipment Bags > Police Equipment Bags > 1440 Top Loader Case 17.10" x 7.50" x 16.00"
Pelican 1440 Top Loader Case 17.10" x 7.50" x 16.00"
Comfort and security can be hard to come by when you want a high quality tactical case--but Pelican makes this process simple. The Pelican 1440 Top Loader is perfect for those who are after the latter characteristics mentioned! This mobile tactical gear case gives you amazing features others are definitely lacking. For instance, you gain the protection from water, dust, chemical exposure and acquire extra dexterity, all due to the O-ring seal and the exceptional strength of this case! You also gain custom features such as the retractable extension handle that makes this easier to navigate when moving. The steel bearings within the wheel mechanism ensure smooth movement as well! All in all, this excellent tactical case awards career professionals with amazing security and convenience--allowing for one to carry the gear that they need within a sealed, safe environment! You can have those critical tactical tools right at hand, right where you need them! ©2002-2019 CopsPlus.com: Pelican 1440 Top Loader Case 17.10" x 7.50" x 16.00" FREE SHIPPING!